A few weeks ago my mom called me to say that my grandparents wanted to buy a new car for my grandmother. Her car is six years old and she barely so much as drives it to the grocery store by herself. 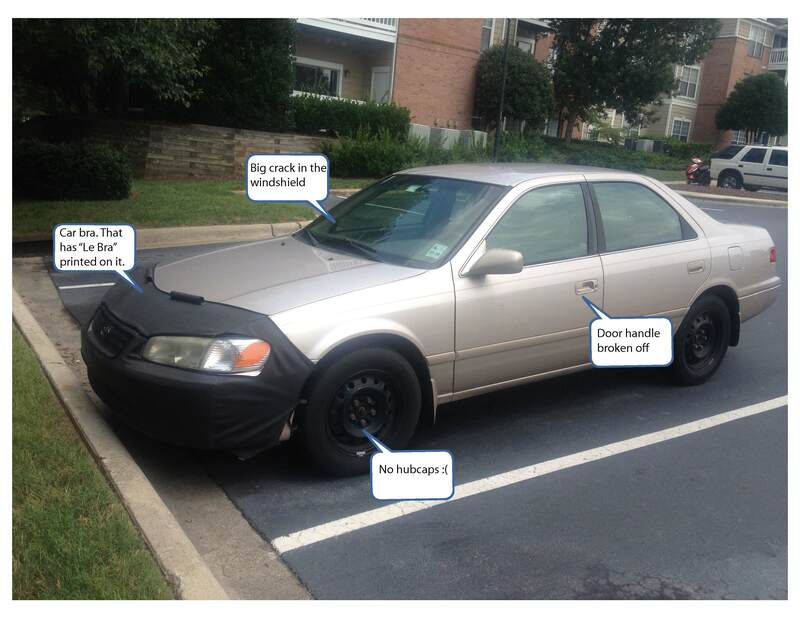 It’s a 2006, only has 50,000 miles on it, has four brand new tires, and is in great shape from extremely little use. So my mom asked my grandpa if he would consider selling it to Jonathan and I for the trade-in value if we were interested. He said sure. So she contacted us about it. While we hadn’t been planning on purchasing a new car until one or both of ours die, the opportunity to buy a used car from people we know took care of it well and that is in such good condition was appealing. Furthermore, this car would ironically look LESS like a grandma-car than the car I currently drive. We decided to try to make it work and gave Mom the go-ahead. The next day I get a text from my mom saying that my grandpa (who is a lot of wonderful things, but patient is not one of them) had decided he wanted the new car immediately and had driven straight to the dealer to trade the old one in. So, no car for us. It was probably definitely better for us financially anyway not to have to come up with money for a car unexpectedly. But I think this is when I started to let myself feel all of the emotions I had previously been keeping at bay about my car. My car is an 11 year old Toyota Camry. It has 110,000 miles on it. It’s been from Louisiana to Chicago and back. And from Chicago to Ohio multiple times. And from Chicago to North Carolina. And from North Carolina to Ohio and back multiple times. And from North Carolina to New York and back. And from North Carolina to Louisiana and back. You get the picture. No paint on the front, hence the car-bra. We actually got the bra right when we bought the car because all of the paint had peeled off of the front bumper. This is just one of many spots where the bra has ripped and tattered shreds of it dangle from the bottom of the car. 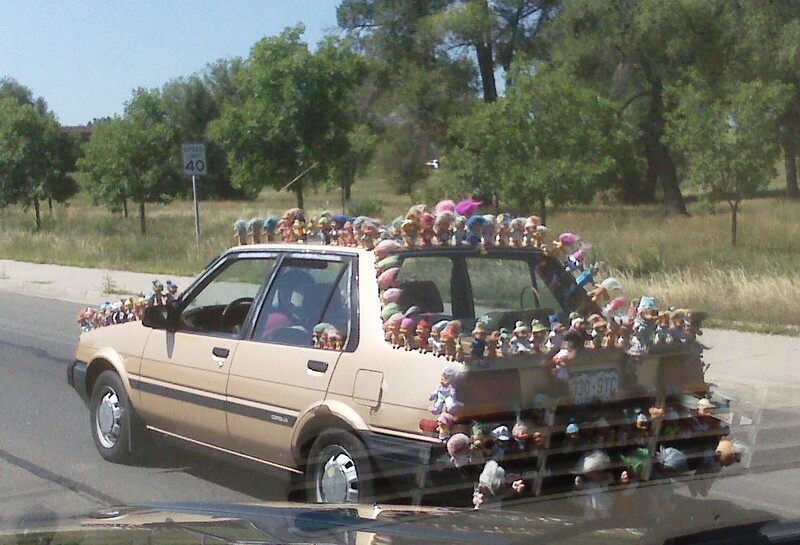 Also, in this photo, no hubcaps. I lost these all within the space of two weeks one winter while I was in college. My theory is that when I had my tires rotated, they weren’t put on tightly enough. 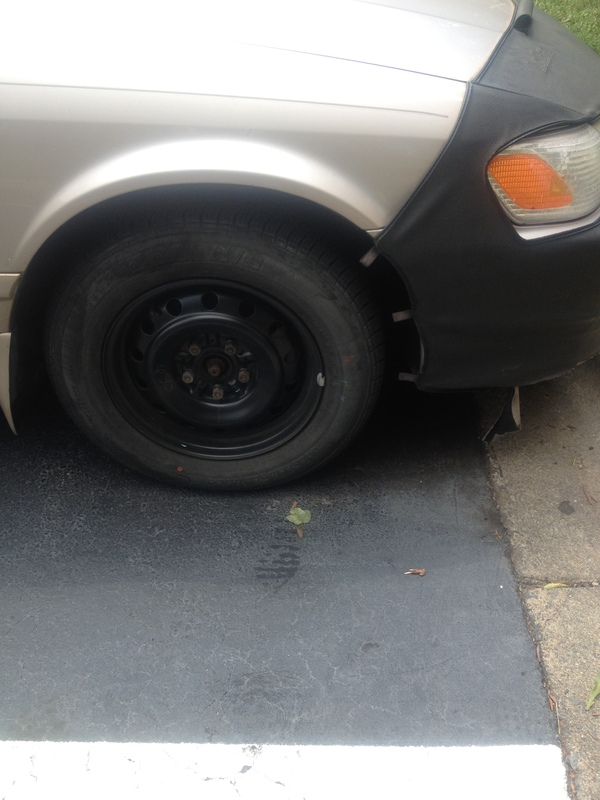 Either that or someone followed me around for two weeks and stole my plastic wheel covers one at a time. 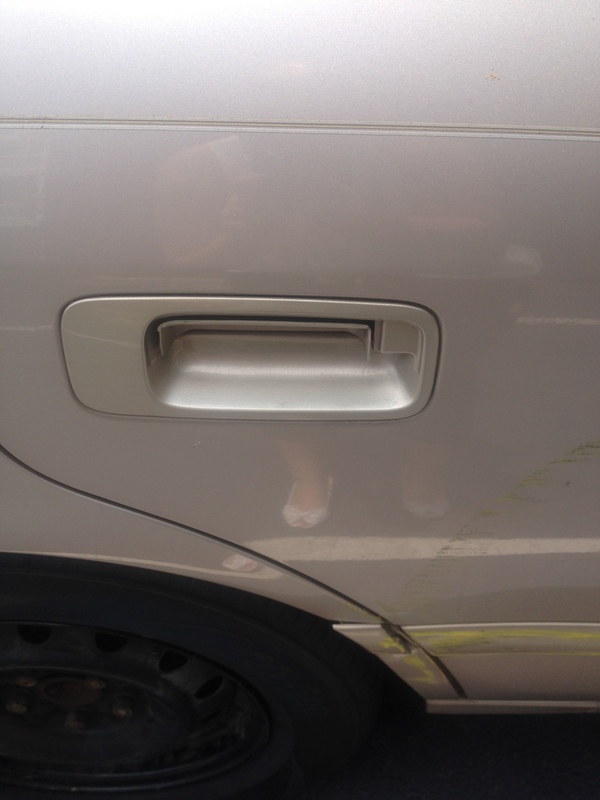 Two missing door handles. The result of harsh winters when my doors were frozen shut. 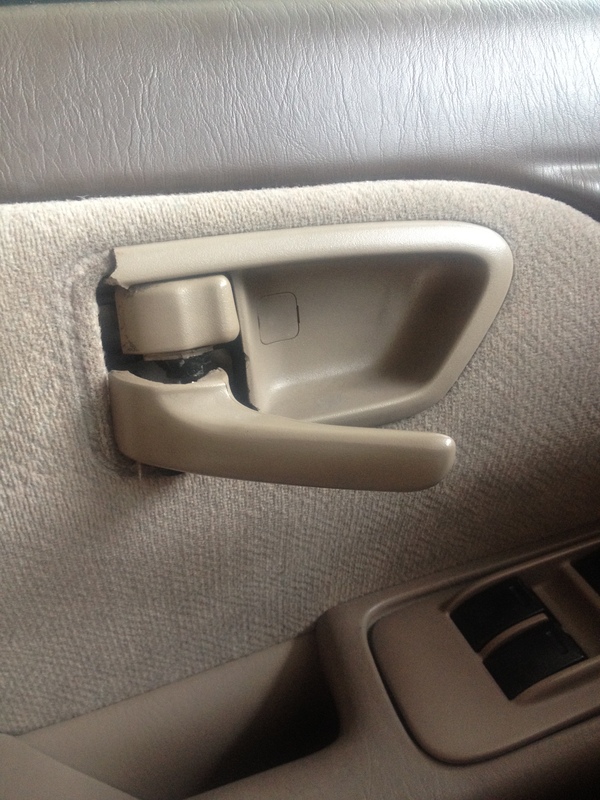 The driver’s door handle I pulled off myself, but it’s only ¾ of the way broken and still functional. The back passenger handle was ripped off by a man called Bob who worked for Public Safety and was supposed to be “helping” me get into my car after a particularly icy day and 30 minutes of trying on my own in sub-zero temperatures. I’ve been missing these handles for 3 ½ years. Loud squeak when opening doors. Ok, seriously. This is what my car sounds like every time someone gets in or out of it. My Car Door Noise. Broken cupholders. So that people will stop being lazy and hold their own cups already! Cracked windshield. Happened my first week in North Carolina before we had even moved into our apartment. 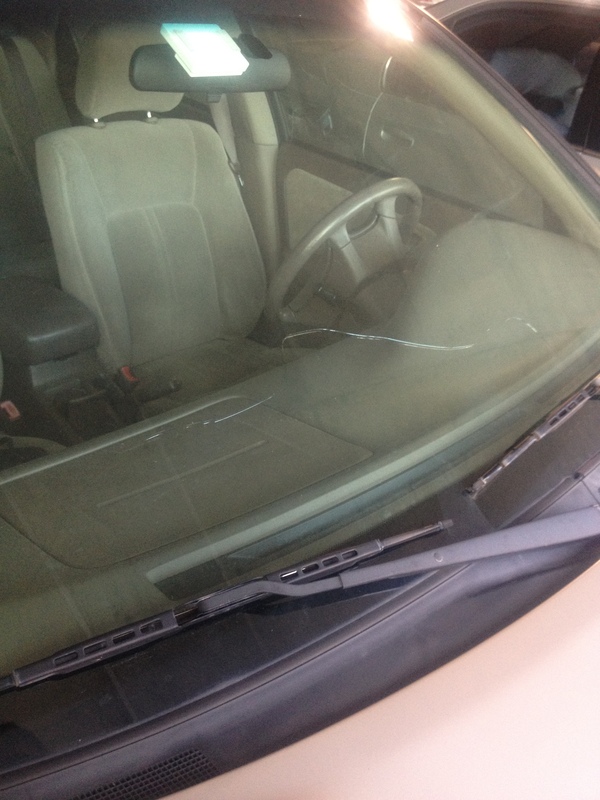 Rock hit the windshield. Crack had traveled all the way across within 3 days. 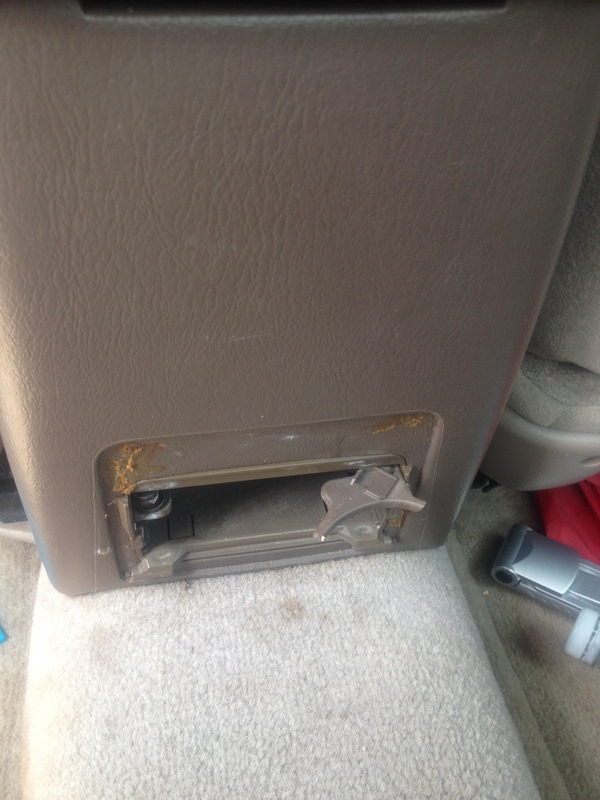 Inside door handle broken. A fairly new development (I think since April.) I went to open my door and discovered the plastic surrounding the handled had cracked off. I was still able to get the door open with some careful maneuvering of the handle, but a few weeks later Jonathan drove my car, yanked on the handle like normal, and pulled the sucker right out. I now have to roll down my window and reach over and open the door with the (broken) outside handle. This is especially awesome when showing up at work in my nice work clothes, arriving at an interview, or when trying to bring in groceries in the rain. 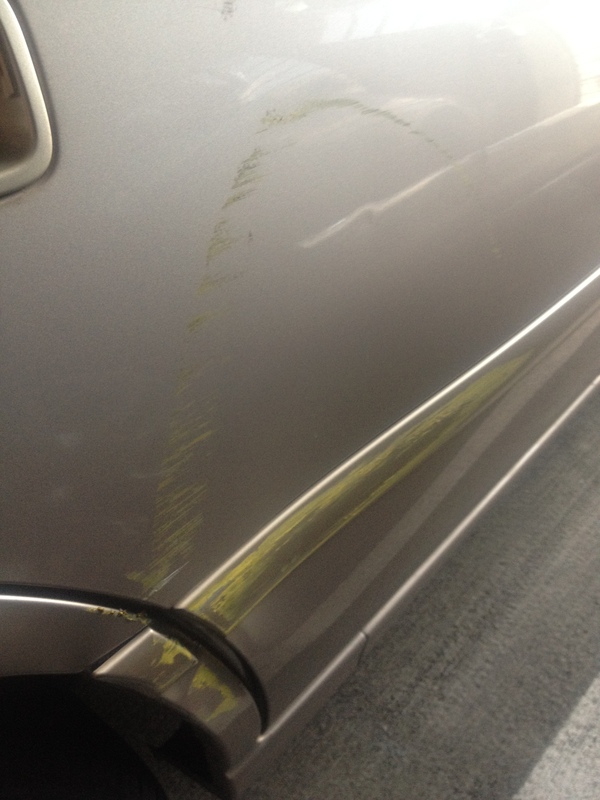 Giant dent in side plus yellow paint smears. My newest addition. This one is a little my fault, but also this idiot woman who I guess works in my building. My building is sort of unique in that it has a parking garage underneath it. The ground floor has restaurants and then floors 2-7 are the parking garage and the all of the offices are on top of that. So, anyway, when you turn into the parking garage from the road you make a sharp 90 degree right turn and then immediately start going straight up a steep ramp. So I was turning in a couple of weeks ago, swinging a little wide to get in because there is a bright yellow post a couple of feet from the wall right at the entrance. As I pull in, a woman in a suburban comes barreling down the ramp towards me way across the center line. So I pull further to the right and my back door clips the yellow post at the entrance. And she looks at me like “ Oh, sorry!” and waves before flooring it out onto the street. So now I have a post-shaped dent and post-colored paint all over my back door. Blue book says that even in “Fair” condition I should be able to get $5,600 for this car if I sell it privately. But even though the car has no major mechanical issues (though it does need new brake pads, but how important is that, really? : ) ) and has been well-maintained on the engine-side of things, I can’t imagine anyone taking a look at this car and wanting to spend more than say $5 on it. Even my Christina, who I can count on to encourage me in all things, has told me there is no way in the world anyone would pay that much for my car. It’s not junky enough to be cool, but too gross for anyone to really want it. *I do actually realize that there are a few things that could make my car ghetto-er. I just was a little afraid to mention them before. -Replacing a door, hood, or bumper with a part from a different colored car. 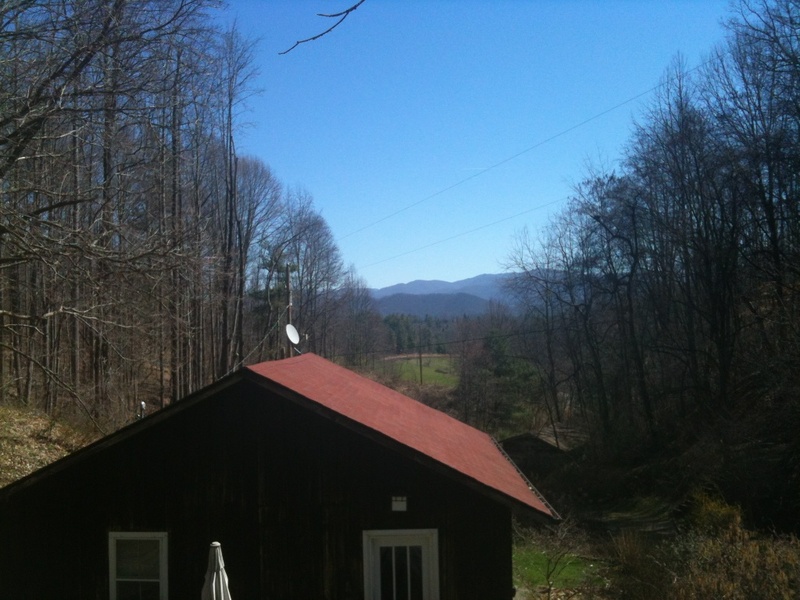 This past weekend Jonathan and I took a mini-vacation up to Asheville, NC. We had never been to Asheville before, but had been talking about going for a while. 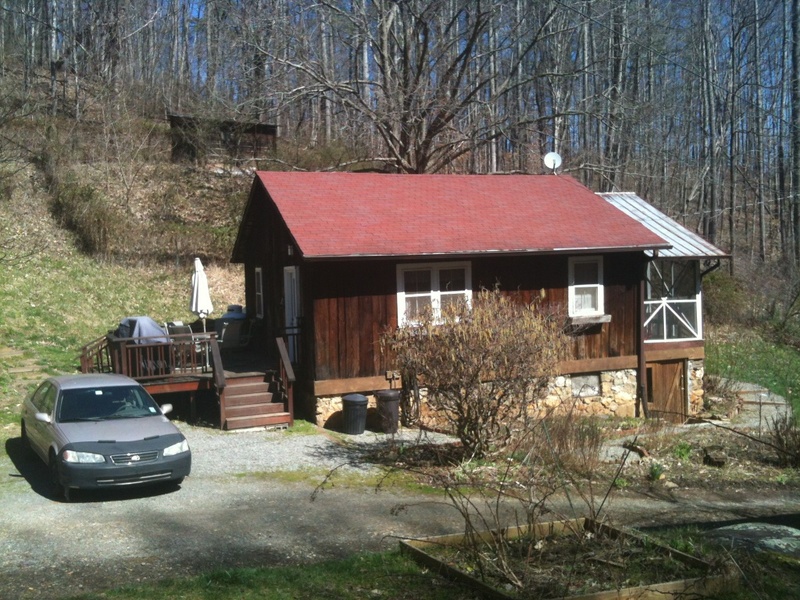 About a month ago I sneakily researched and booked a cabin in the mountains a few miles north of Asheville. Then I sneakily requested time off for Friday afternoon and I sneakily packed all of our things. I got home around lunchtime on Friday and told Jonathan we were taking a trip! I was a little nervous about the cabin since I’d seen pictures of it on the internet, but obviously had never been there. Pictures can be deceiving. But it was absolutely lovely! See! 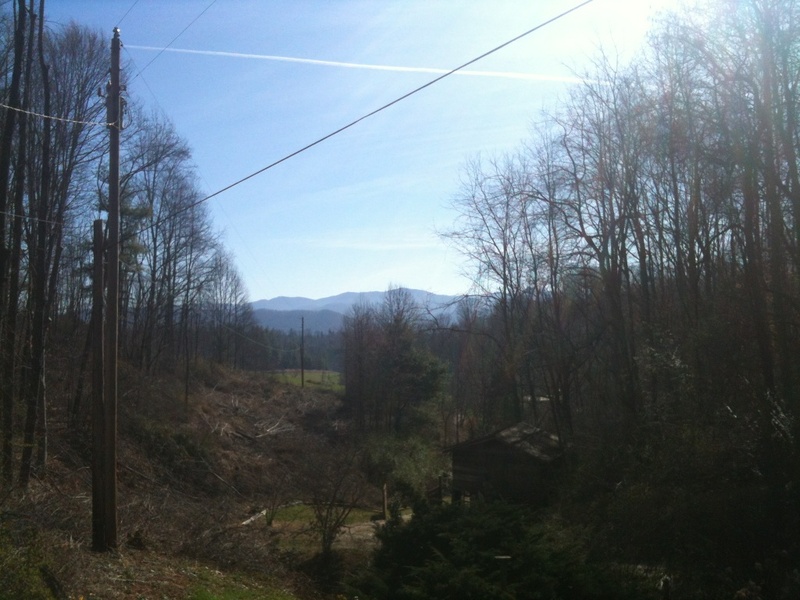 This is the view from behind the house if you are standing up on the deck where the hot tub is. We hung out in downtown Asheville on Saturday. It is a really unique city. Most cities you visit have some unique qualities, but more or less the same feel to them, but I can honestly say that Asheville is different. I have never seen so many hipsters in one place. It’s a small city, but there were street musicians everywhere, some sort of protest against nuclear power plants going on in a little park (after which the protesters marched single file through town silently except for a few people who were banging on pots or drums. I am positive that at least half of them had absolutely no idea why they were there), and people openly passing joints back and forth while waiting to cross the street. Asheville is one of those places where you feel obnoxiously preppy while wearing skinny jeans a plain blue sweater and Toms. We had dinner Saturday night at this fantastic little hole-in-the-wall restaurant called Nine Mile. I found it on Yelp and am so glad we picked it. It is in a really weird location in the middle of this historic neighborhood where the houses are old and enormous, but pretty run-down. You’re just driving down the street through this neighborhood and then there is randomly this one building on the residential street that has a little corner grocery store and this restaurant in it. It’s an interesting little restaurant, long and very narrow, with a purple tin ceiling and old wood floors. The atmosphere was great, pretty intimate and nice, but not fancy, and the food, which is Caribbean-inspired, was delicious! Jonathan had jerk chicken with a creamy mango-y sauce and veggies and I had mahi mahi with a banana mango relish over linguine with peppers and a coconut cream sauce. AMAZING. Over the weekend we also had a lot of time for talking. We talked through (and over and around) lots of possibilities concerning me going to grad school. I got accepted to NC State to do a Master’s in cultural anthropology. It’s a two-year program, but it’s not funded (at least for the first year) And I would only be able to work part-time while going to school. Which means cutting my income at least in half and also taking out a loan to cover tuition which would be adding to a decent amount of student loans I already have from Wheaton. I was also still waiting to hear from Ohio State regarding an MA/PhD program I had applied to there and had some positive interactions with a professor in the program who seemed very interested in working with me. After talking about all of the options for a while we landed on a possible solution to the dilemma of wanting to go to school and wanting to be able to afford it. We decided that if I got into Ohio State I could look into the possibility of deferring for a year and we could spend this next year working and saving as much as possible. That way we could enjoy another year in Raleigh (which we love), but still have a concrete plan for what we were doing next and something for me to really look forward to. Because the program is an MA/PhD I felt comfortable deferring for a year because after I was in I’d be in for good and wouldn’t have to worry about applying to PhD’s etc. And Jonathan felt good about this plan because he could continue to apply to Ohio State’s MFA program (the entire time I was doing my degree if necessary) because it is one of his favorite programs. And we both felt good about this plan because if our present income remains steady we should be able to save a little every month barring a huge crisis. We thought, “We are geniuses! This is perfect plan” (at least, that’s what I thought.) We (I) started making all kinds of plans. 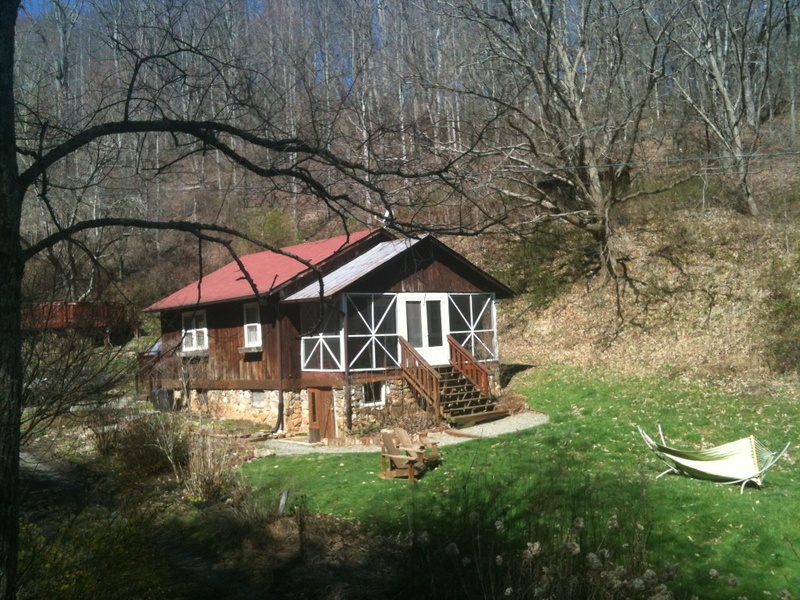 I found a little house for us to rent next year that costs barely more than our apartment. I started planning a trip to visit Jonathan’s brother in South Africa next summer (where he is not yet 100% certain he will be.) Also potential side-trips from that trip (you know, long layovers in Europe, that kind of thing.) And also a mission trip this year to either Uganda or Romania (effectively spending all of the money we’d be “saving” during that year, I know.) I felt happy and peaceful and excited and thankful that God had finally given us an answer. And then…we returned home. Away from the magical mountain cabin I discovered three forms of rejection from Ohio State waiting for me—one online and two hard copies, just in case I didn’t get it the first time….they really, really don’t want me. I was beyond frustrated. Honestly, I am still really frustrated. I feel like all I want is to do the right thing—to pursue what I should pursue in a financially responsible way, and to be selfless in making sure whatever we decide doesn’t keep Jonathan from being able to pursue his goals as well. I mean…these are all good things. And yet, not matter which way I look at it, it seems like the sort of decision where somebody loses. Where something important is lost. If I don’t go to school I think I’ll regret it. If I go to school and it keeps Jonathan from being able to do what he wants, I’ll regret it. If I go to school and we end up tens of thousands of dollars further in debt, I will regret it. There just isn’t an easy solution. In fact, right now it feels like there isn’t a solution at all. And the days keep ticking by til April 15th, the day we have to officially make a decision. And I genuinely feel further away from a decision than I felt when we first started talking about it. Last week in our community group we were discussing a sermon our pastor, Tyler had given about prayer and about Moses’s relationship with the Lord through prayer. The passage we focused on was from Exodus 33:12 where Moses says to the Lord, “You have said, ‘I know you by name and you have found favor with me.’ If you are pleased with me, teach me your ways so that I may know you and continue to find favor with you. '” As I have gone through this week of frustration…of thinking I’ve finally found an answer and then discovering that I haven’t got a clue… of honestly deep frustration with God over his lack of a clear answer, I have been really impacted by the thought that God knows me by name. He knows me intimately…what I’m good at and what my desires are, my hopes and my fears. And it occurs to me that maybe the prayer I should be praying is not, “God, what should I do with my life? Should I go to grad school or not? What is the right answer to this question?” but rather, “God, teach me your ways so that I may know you and continue to find favor with you.” And somehow learn to trust that the God who knows me by name really does know what’s best for me. That I don’t have to try so hard to figure it out on my own. Even when God doesn’t seem particularly interested in telling me which way to go. 🙂 Jonathan put it this way—that instead of praying for God to tell us what the right decision is, perhaps we should pray that God would change our hearts to be the kind of people who make right decisions because we are directed by the Holy Spirit. I will be honest. I am not completely comforted by this. And I haven’t been able to completely stop myself from trying to figure out solutions. But I do think there is truth here. And I know that, more than anything else, I need God to show me His ways.